How Many Nugs? 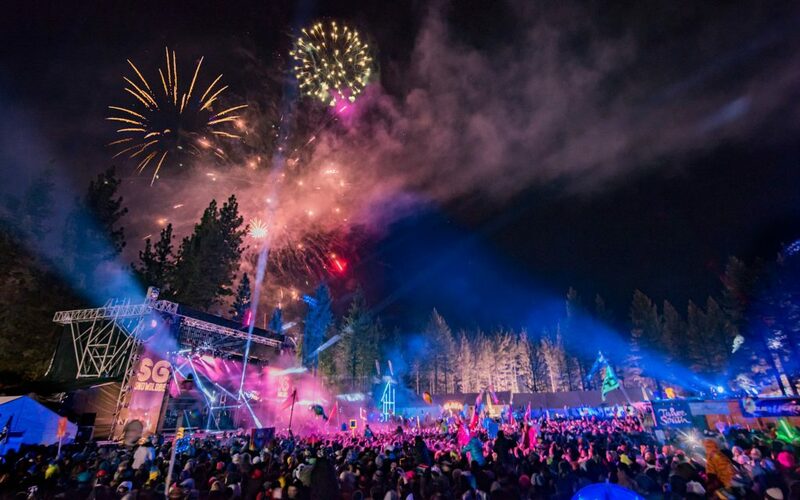 Your Guess Could Take You to the Snowglobe Music Festival in Lake Tahoe! Still searching for that perfect adventure into the New Year? You’re in luck! It’s the season of giving and we’re ready to send you on a trip of a lifetime! All you have to do is guess the number of nugs in the snow globe below and you could win 4 VIP tickets to the SOLD OUT Snowglobe Music Festival December 29th – 31st in Lake Tahoe, CA! It’s easy to enter! 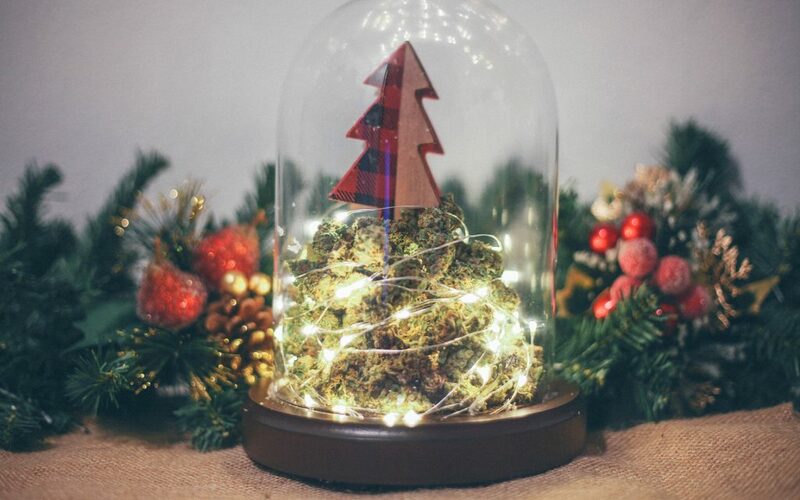 All you have to do is guess how many nugs are in the snow globe below and follow the steps to submit your guess on either Twitter or Instagram. We’ve included a variety of images to help you make the best guess possible. Good luck! Snow globe measures 8.3″ high by 6.7″ wide. Buds are a mix of Jack the Ripper and XJ-13. Tweet your guess to @Leafly or reply to @Leafly on Instagram with your guess. 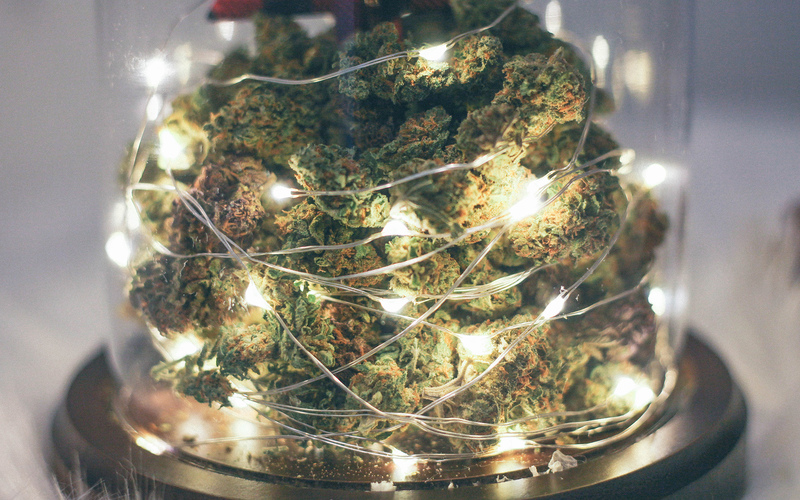 The snow globe’s dimensions are 8.3″ high by 6.7″ wide, and it’s filled with a mix of Jack the Ripper and XJ-13 cannabis. Tag two friends you want to bring to the show in your tweet or Instagram comment. Be sure to include the hashtag #countdowncontest in your guess. The first person to correctly guess the exact number of nugs will win. If no person correctly guesses, the earliest, closest guess will win. We’ll pick one winner from all combined Twitter and Instagram submissions. One submission per social media account per day. Submissions end on Wednesday, December 14th at 11:59 a.m. PST. The winner will be announced on December 16th at 12:00 p.m. PST! Our lucky winner will have two days to accept before the prize will be awarded to second place. All participants and guests must be 21+. See full contest rules below. 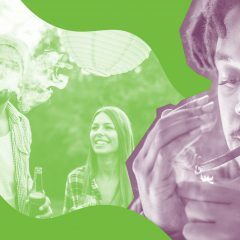 Eligibility: The Leafly® & SnowGlobe™ Flyaway Contest (the “Contest”) is open only to legal residents of the 50 United States and the District of Columbia who are age 21 years and older as of the beginning of the Contest Period. You must have a registered Instagram or Twitter (each a “Platform”) user account (“User Account”) to enter. Employees, officers, and directors of Sponsor, and the immediate family members (including spouses, unmarried partners, parents, grandparents, siblings, children and grandchildren) of any such employee, officer or director, are not eligible to enter the Contest or win a prize. The Contest is subject to all applicable federal, state and local laws and regulations and is void where prohibited by law. Contest Period: The Contest begins at 12:01 p.m. Pacific Time (“PT”), December 6, 2016, and ends at 11:59 a.m. PT, December 14, 2016 (the “Contest Period”). Entries received after the Contest Period shall be disqualified. Sponsor’s computer is the official time-keeping device for the Contest. Complete the steps for the applicable Platform set forth below (each an “Entry” and collectively, the “Entries”). Each Entry must comply with the Submission Guidelines below. Leafly reserves the right, in its sole discretion, to reject or disqualify any Entry that does not comply with the Submission Guidelines or is otherwise inappropriate, offensive, not keeping with Leafly’s image or if it is determined that the entrant has not complied with these Official Rules. Limit one (1) Entry per person per Platform per day during the Contest Period. 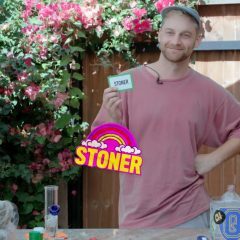 Any attempt to obtain more than the permissible number of Entries by using multiple/different user accounts or otherwise may void your Entries and/or disqualify you from the Contest as determined by Leafly in its sole discretion. Any use of robotic, repetitive, automatic, programmed or similar entry methods or agents (including, but not limited to, contest entry services) will void all Entries by that entrant. Winner Selection/Odds. One (1) winner will be selected on or about noon PT on December 16, 2016 from all eligible Entries received. The eligible entrant who guesses the correct number of nugs will be selected the winner. In the event that more than one entrant guesses the correct number, then the entrant who first guessed the correct number will be selected as the winner. In the event that there is still a tie, the winner will be randomly selected by Sponsor from the tied entries. If no entrant guesses the correct number, then the eligible entrant who guessed the number closest to the correct number shall be selected the winner, and any ties will be resolved in accordance with the process above. Odds of winning depends on number of total eligible Entries received. Winner Notification and Prize Acceptance: The potential winner will be notified via direct message on the applicable Platform. Potential winners may be required to complete and return an Affidavit of Eligibility and Liability/Publicity Release (except where prohibited), IRS W-9 form, assignment of copyright, and/or other requested documentation within two (2) days of date of notification. If such documents and/or responses are not returned within the specified time period, a prize or prize notification is returned as undeliverable, Leafly is unable to contact a potential winner, or a potential winner is not in compliance with these Official Rules, the prize will be forfeited and, at Leafly’s discretion, an alternate winner may (but is not required to) be selected. If no alternate selection is conducted for a prize, the prize will not be awarded. Leafly shall not have any liability for a winner’s failure to receive notices due to spam, junk, email or other security settings or winners’ provision of incorrect or otherwise nonfunctioning contact information. Leafly’s decisions will be final in all matters relating to this Contest. Additional Prize Details and Limitations: Winner is solely responsible for booking all airline travel to and from the Event, confirming reservation at the Beach Retreat Hotel, and for any travel or hotel/accommodation costs, taxes, fees and other charges in excess of the awarded voucher amounts. Without limiting the foregoing, Winner is responsible for any and all applicable fees, service charges, surcharges or passenger facility charges and all insurance costs, federal, state, local and foreign taxes, if any, gratuities, meals, incidentals and any other unspecified expenses associated with acceptance or use of a prize. Tickets to the Event are issued by and under the control of the Event owner, which may modify, change, or cancel the Event at its discretion. Lost, stolen, damaged or destroyed travel and hotel vouchers will not be replaced. 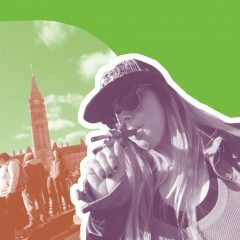 Publicity Release: Acceptance of any prize constitutes permission for Leafly and its designees to use winner’s name, Platform User Account handle and/or likeness for advertising and marketing purposes, without additional compensation, in any media, worldwide, unless otherwise prohibited by law. Releases, Waivers and Limitation of Liability: By participating in the Contest, you hereby release Leafly and its respective parent companies, affiliates, and promotional partners, and each of their respective officers, directors, employees, and agents (the “Released Parties”) from and against any and all legal claims, losses, injuries, demands, damages, and/or causes of actions that may occur, directly or indirectly, whether caused by negligence or not, including without limitation for personal injury, bodily injury, property damage, violation of publicity or privacy, or defamation, arising from: (i) your participation in the Contest and submission of an Entry, and/or your acceptance, possession, use or misuse of any prize or any portion thereof; (ii) any claims of infringement related to Leafly’s use of an Entry submitted in connection with the Contest; (iii) technical failures of any kind, including without limitation, the malfunctioning of any computer, cable, network, hardware or software; (iv) the unavailability of any transmissions or internet service; (v) unauthorized human intervention in any part of the entry process or the Contest; (vi) electronic or human error which may occur in the administration of the Contest or processing of entries or votes; and (vii) Leafly’s use of your Entry, name or likeness. Further, you hereby acknowledge that Released Parties have neither made nor are in any manner responsible or liable for any warranty, representation or guarantee, express or implied, in fact or in law, relative to a prize awarded in connection with the Contest. The releases hereunder are intended to apply to all claims known and not known or suspected to exist with the intent of waiving the effect of laws requiring the intent to release future unknown claims. If, for any reason, the fairness or integrity of the Contest becomes compromised, Leafly reserves the right to terminate or modify the Contest, and to disqualify any individual who tampers with the entry process or the administration of the Contest. 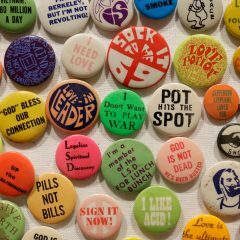 Governing Law; Disputes: This Contest is governed by the laws of the State of Washington, without regard to its conflict of laws rules. By entering, entrants and winners hereby submit to the jurisdiction and venue of the federal, state and local courts located in Seattle, Washington. Any attempt by an entrant or any other individual to deliberately damage any website related to Leafly or the Contest may be in violation of criminal and civil laws, and should such an attempt be made, Leafly reserves the right to seek damages from such entrant to the fullest extent permitted by law. BY ENTERING THE CONTEST, ENTRANT AGREES THAT, TO THE MAXIMUM EXTENT PERMITTED BY LAW: (1) ANY AND ALL DISPUTES, CLAIMS AND CAUSES OF ACTION ARISING OUT OF OR CONNECTED WITH THE CONTEST, OR ANY PRIZE AWARDED, WILL BE RESOLVED INDIVIDUALLY, WITHOUT RESORT TO ANY FORM OF CLASS ACTION; (2) ANY AND ALL CLAIMS, JUDGMENTS AND AWARDS WILL BE LIMITED TO ACTUAL THIRD-PARTY, OUT-OF-POCKET COSTS INCURRED (IF ANY), NOT TO EXCEED TWO HUNDRED FIFTY DOLLARS ($250.00), BUT IN NO EVENT WILL ATTORNEYS’ FEES BE AWARDED OR RECOVERABLE; (3) UNDER NO CIRCUMSTANCES WILL ANY ENTRANT BE PERMITTED TO OBTAIN ANY AWARD FOR, AND ENTRANT HEREBY KNOWINGLY AND EXPRESSLY WAIVES ALL RIGHTS TO SEEK, PUNITIVE, INCIDENTAL, CONSEQUENTIAL OR SPECIAL DAMAGES, LOST PROFITS AND/OR ANY OTHER DAMAGES, OTHER THAN ACTUAL OUT-OF-POCKET EXPENSES NOT TO EXCEED TWO HUNDRED FIFTY DOLLARS ($250.00), AND/OR ANY RIGHTS TO HAVE DAMAGES MULTIPLIED OR OTHERWISE INCREASED; AND (4) ENTRANT’S REMEDIES ARE LIMITED TO A CLAIM FOR MONEY DAMAGES (IF ANY) AND ENTRANT IRREVOCABLY WAIVES ANY RIGHT TO SEEK INJUNCTIVE OR EQUITABLE RELIEF. SOME JURISDICTIONS DO NOT ALLOW THE LIMITATIONS OR EXCLUSION OF LIABILITY FOR INCIDENTAL OR CONSEQUENTIAL DAMAGES, SO THE ABOVE MAY NOT APPLY TO YOU. 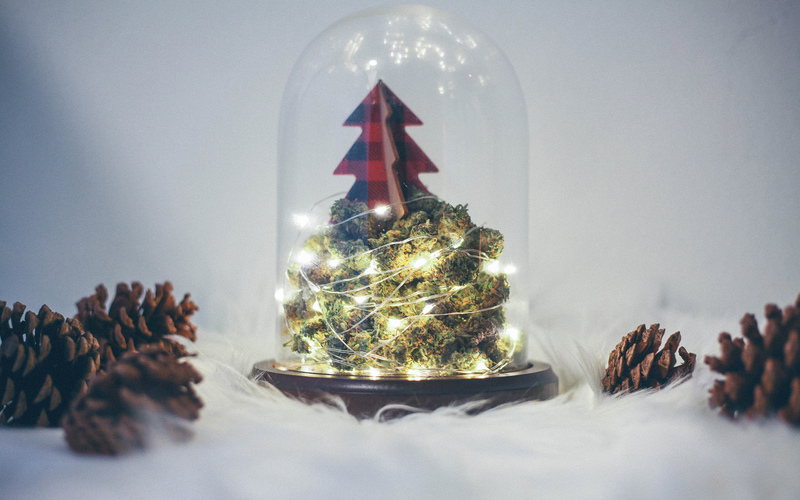 Winner’s List: To request a list of winners: (a) send a stamped self-addressed envelope to: Marketing – Leafly & SnowGlobe Flyaway Contest Winner’s List, 71 Columbia Street, Suite 300, Seattle, WA 98104; or (b) email social@leafly.com with Leafly & SnowGlobe Flyaway Contest Winner’s List in the subject line. Sponsor: Leafly Holdings, Inc., 71 Columbia Street, Suite 300, Seattle, WA 98104. Instagram: The Contest is not sponsored, endorsed or administered by, or associated with, Instagram. You understand that you are providing your information to Leafly and not to Instagram. Any questions, comments or complaints regarding the Contest should be directed at Leafly, and not to Instagram. Twitter: The Contest is not sponsored, endorsed or administered by, or associated with, Twitter. You understand that you are providing your information to Leafly and not to Twitter. Any questions, comments or complaints regarding the Contest should be directed at Leafly, and not to Twitter.